When it comes to Mount Holyoke College Model United Nations (MHCMUN), I was a little late to the party. I joined the second semester of my sophomore year. I knew instantly that I had found it: a group that I would stay a part of until the end of college. 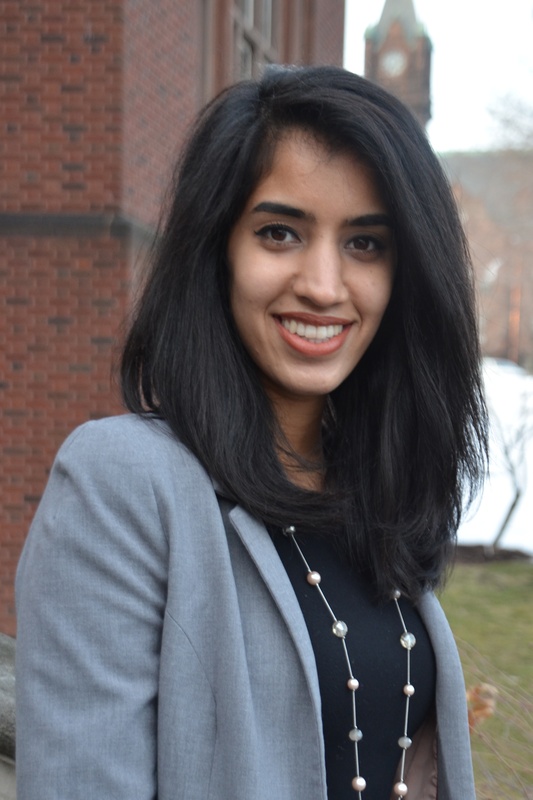 My initial interest in Model UN at Mount Holyoke was piqued by the welcoming executive board, the camaraderie of the team, and the confidence exuded by experienced members. During weekly simulations, I listened to and defended the views of my characters, and slowly learned to steer conversations and people in the direction I wanted. Being able to maneuver the dynamics of a room is truly a powerful feeling—and is the making of an effective leader. For me, joining Model UN brought leadership opportunities. I served as treasurer during my junior year and as vice president during senior year. These roles let me facilitate the growth of an organization that was teaching me so much. Along the way, I made unforgettable memories. Photo above is courtesy of Sundus Noeen ’16. 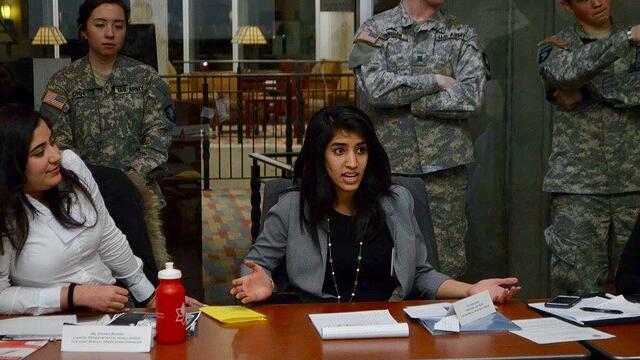 I attended my first Model UN conference during my sophomore year at the United States Military Academy at West Point. You don’t truly understand the exhilarating world of Model UN until you attend your first conference: the eloquent speeches, the subtle and secretive tactics, the art of building alliances. Two years later, this same conference, the West Point Model United Nations Invitational, would be the last of my career. The conference at West Point involves seven crisis committees, all related to the US domestic and foreign security apparatus, which are connected to and affected by one another. This interconnectedness gives delegates the opportunity to interact with those outside of their committees and to plan or solve crises on a much grander scale. It also simulates the complexity of American politics, which directly impacts military operations. At the February 2016 conference, I was the commander of the US Army 160th Special Operations Aviation Regiment committee. To prepare, I had to be familiar with the US political system and understand military jargon, tactics, and strategies. My committee provided aviation support to the Joint Special Operations Command committee, which helps study special operations techniques and execute special operations missions worldwide. We received orders from the National Security Council, communicated with members of Congress, debated military strategies, and conducted special military operations, including hostage extraction and intel gathering. During breaks between three- to four-hour committee sessions, we toured campus, ate with cadets, learned about cadet life, and took part in an interactive weapons display and a firing simulation. At night, we socialized outside the context of committees, including at a formal gala that featured cadets dressed in formal white uniforms and delegates dressed to the nines. Although the knowledge you need to thrive at any given Model UN conference is mostly conference-specific, the skills and tactics you use as a delegate are not. They are universal—and widely applicable. As I pursue a career in medicine, I know I will work well under pressure, communicate effectively with colleagues and patients, and negotiate confidently with those of differing views. Always be prepared. Do your research. Claim credit for your work. Otherwise, someone else will. Delivery is just as important as content. Fake confidence—no one will know the difference. Don’t be afraid to attack an argument, but be diplomatic. Always be one of the first to speak up in a new group. After that, it will get easier and easier every time you speak. Know when to compromise. Little victories are better than no victories. Be careful about who you trust. Alliances should bring mutual benefits. People are more receptive to a good idea when it comes from someone they respect. If you have a good sense of humor, use it—to stand out and garner more interest. 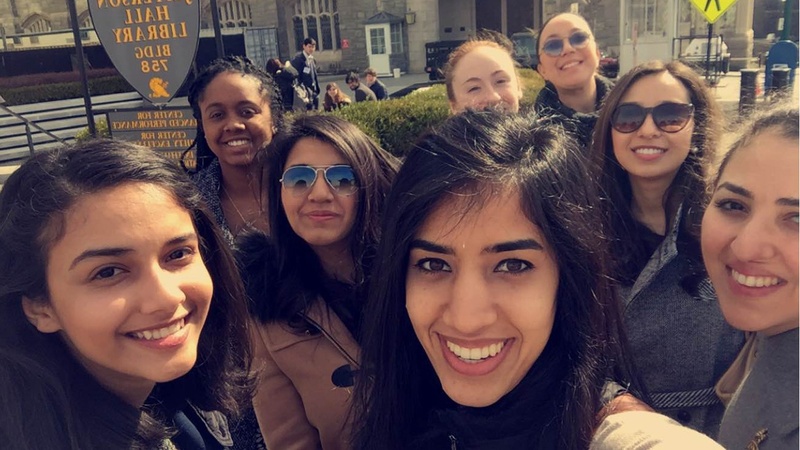 This is the third blog in a four-part series featuring members of MHC’s formidable Model UN team and their spring 2016 conferences. Read the full series.